Are you one of the many brave souls hosting a houseful of guests for Christmas this year? Are you feeling the pressure already? 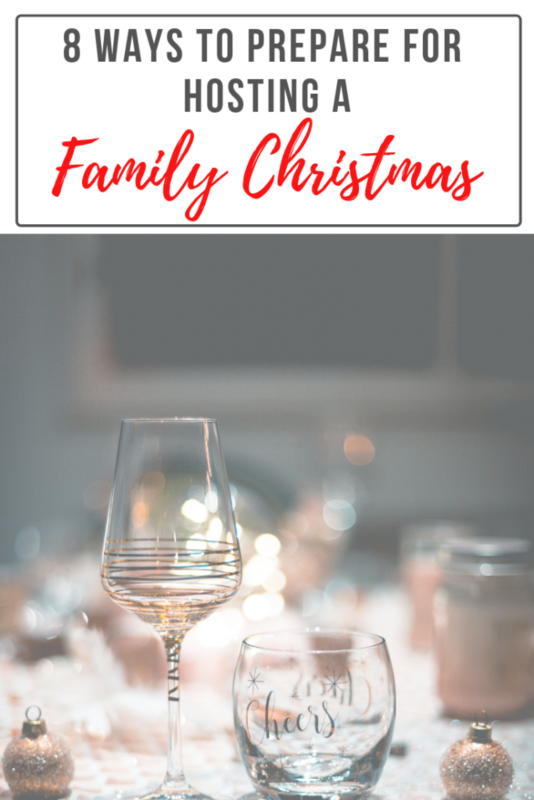 Just attending a Christmas gathering can be stressful, but actually being the host can be a very daunting prospect indeed. From making your house look beautiful and festive to producing a delicious feast, to keeping everyone from great-aunts to baby cousins entertained. Everyone has his or her own traditions and expectations, how can you keep everyone happy? 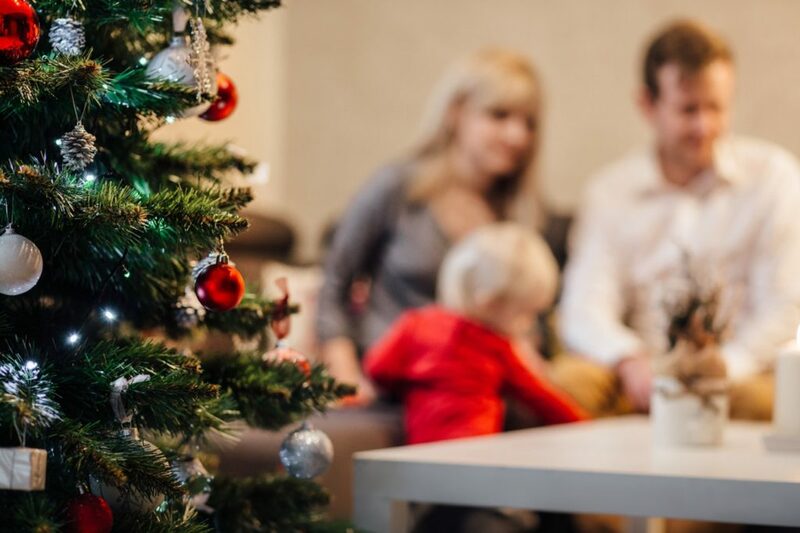 Read on to discover 8 ways to stay organized when hosting a family Christmas. You’ve got this! It’s important to start planning well before the Holidays so that you’re prepared, organized and not racing around like a lunatic at the last minute. Lists are a great way to get organized and figure out what needs to be done and when. Wunderlist is a great app you can use on your phone to help you stay in control. You can create a to-do list with reminders and due dates to keep you on track. Start by making a list of who’s coming and how many guests are actually staying with you. 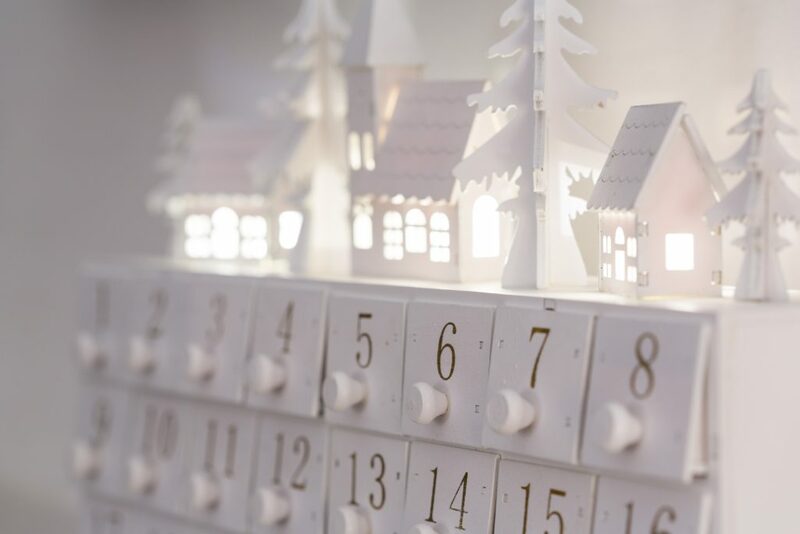 Don’t feel that you need to invite the whole town, keep the numbers to what you can manage (and fit in your home!). Next, you’ll need to plan your recipes and make lists of all the food and drinks you need to buy. Don’t forget breakfast and snacks for those guests who are staying. Keep it simple, OJ and croissants are perfectly fine to keep hunger at bay until Christmas dinner is served. It might be wise to check if any of your guests have special dietary requirements or food allergies to save any last minute embarrassment. Check the essentials. Do you have enough chairs, glasses, plates and serving dishes? For those guests that are staying, you’ll need plenty of towels and extra bedding. Make a list of anything you need to buy (or borrow) to avoid any last minute panic. Oh, and don’t forget to stock up on toilet paper! Once you have all of your lists compiled, you should be much clearer on what you need to do and when: the earlier the better. Do as much as you possibly can in advance to ease the pressure on the day. This gives you a much better chance of actually enjoying the day along with everyone else. Shop early to avoid the crowds. Wrap gifts as soon as you’ve bought them, or better still have them gift-wrapped in the store. Buy all your non-fresh groceries in advance and store them in your pantry. Make as many dishes as you can in advance and freeze them, so you don’t have so much cooking to do on the day. You can even set the table the night before; don’t forget to add some festive decorations and candles! Having a timeline for the day can help you to stay on track with your preparations and not get into a complete mess. Enlist a cooking partner to keep you company in the kitchen (and bring you glasses of wine!) to help share the workload. This makes for a much more enjoyable experience for you. We all want our house to look beautiful and tidy for our guests don’t we? However, you don’t need to over-exert yourself trying to take on the whole house. Concentrate on the areas that your guests will use, such as the family room, bathrooms, and coat rack. You may also need to clear out your fridge and pantry to make space for all the Christmas groceries. Nobody’s going to notice a little dust on the shelves if you have a pretty tree with some twinkle lights. It might be a good idea to put away any breakables if you have young children coming. And to avoid people walking mud through your house, why not have a basket full of inexpensive slippers by the front door for your guests to use? Amazon has some great options to buy slippers in bulk! Nobody expects you to be Martha Stewart when you’re entertaining a houseful of guests. Keep it as simple as you can to make your life a little easier. You don’t need to serve fancy appetizers: some cheese and crackers and a bowl of olives are perfectly acceptable. Say yes to store-bought desserts if it helps to take the pressure off. Remember, now is definitely not the time to be experimenting with new recipes. Avoid any potential cooking disasters by sticking to what you know. Many people, understandably, like to bring out their best china and serving dishes at this time of year. Keep in mind that there’ll be a great deal more washing up to do. You might prefer to use disposable plates instead, eco-friendly of course. This makes for a much faster cleanup afterward, leaving more time for fun and games with your guests! You may feel like you should be doing everything by yourself, but it’s perfectly reasonable to delegate and share the burden. It’s your special day as much as it is your guests. You should be able to enjoy and participate in the festivities and not be left alone in the kitchen. Make it a group effort and people will enjoy helping out. Ask your guests to bring some side dishes so that you can concentrate on the main part of the meal. Instead of constantly serving drinks to your guests, set up a drink station in one area of the room. Assign the task to someone in particular or just tell your guests to serve themselves. It’s all part of the fun! If you do have a stack of washing up to do after, let your guests help out. It’ll get the job done so much more quickly. It may be a good idea to set up a trashcan and a recycling can in a prominent position in the house so that people can tidy up as they go. Disposable cups and plates, gift-wrapping, boxes, you name it. The clutter will build up quickly, so ask everyone to help out and keep it under control! Try to accept that however the day goes, it will NOT be perfect. Keeping this in mind can help take a huge weight off your shoulders. It’s inevitable when extended family and friends come together that there’ll be disagreements. Everyone has his or her own expectations for Christmas, and it’s sometimes hard to please everyone. Don’t stress about the small stuff. It’s okay to bend the rules that you normally live by. Let’s face it, the kids are going to eat their body weight in sugar, and probably won’t touch a single vegetable. Not to mention the dog eating all the scraps. Try to let it go for just one day, you can get back to your usual routine when it’s all over. Ignore that pesky voice in the back of your head telling you what you should’ve done differently. Try and enjoy the moment, family and friends gathered together in your wonderful home. As long as your house doesn’t burn to the ground and nobody gets food poisoning, you don’t need to worry about anything else. I doubt anyone else will be worrying about any imperfections, so just relax. A great time will be had by all! It shouldn’t take too much effort to create the perfect ambiance with some simple décor and candles, the warm glow of a fire and a Christmas playlist in the background. This’ll be sure to get everyone in the festive spirit. If family discussions get a little heated, it might be a good idea to have a few distractions up your sleeve. Have some board games to hand, or set up a small craft table for the kids. 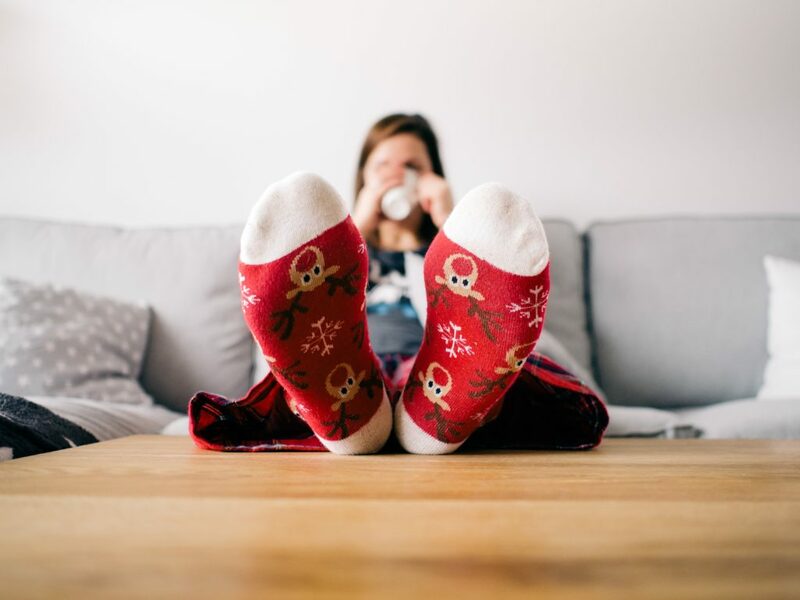 A family-friendly Holiday movie always goes down nicely after the Christmas meal or if anyone is feeling energetic, a brisk walk around the neighborhood! If you’re brave enough, try and make it a device-free day and encourage REAL face-to-face conversations. Believe it or not, some people might actually struggle with this, so having some conversation-starter cards such as these at each setting can help break the ice. Mix up the seating plan after each course, that way everyone gets to chat with everyone! Let’s face it; you’re going to be run off your feet both preparing for Christmas and on the day itself. You need to give yourself a break in order to stay sane. Having a houseful of guests can be exhausting and overwhelming, and nobody will mind if you feel the need to escape for 5 minutes. Go and sit in your room and light a candle, meditate or simply breathe deeply. If you prefer, go out for a walk and breathe in some fresh air. It’ll do wonders for clearing your head and recharging your batteries. Remember it’s your Christmas Day too. 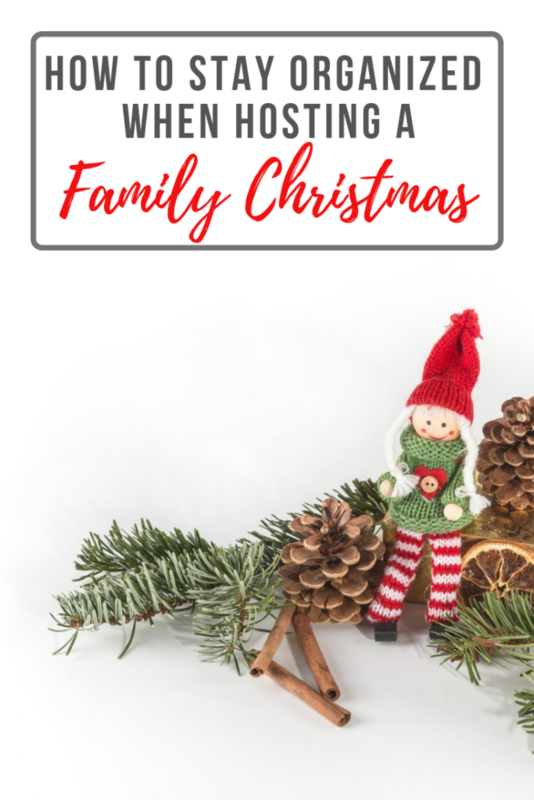 If you follow even just a few of these 8 ways to stay organized when hosting a family Christmas, you’ll be able to enjoy the day as much as your guests. Make plenty of lists, get yourself organized and start preparing early, accept as much help as you can and don’t forget to look after yourself too. With some smart planning and expectation managing, you’ll be sure to have a fun and memorable Christmas Day with all of your guests! 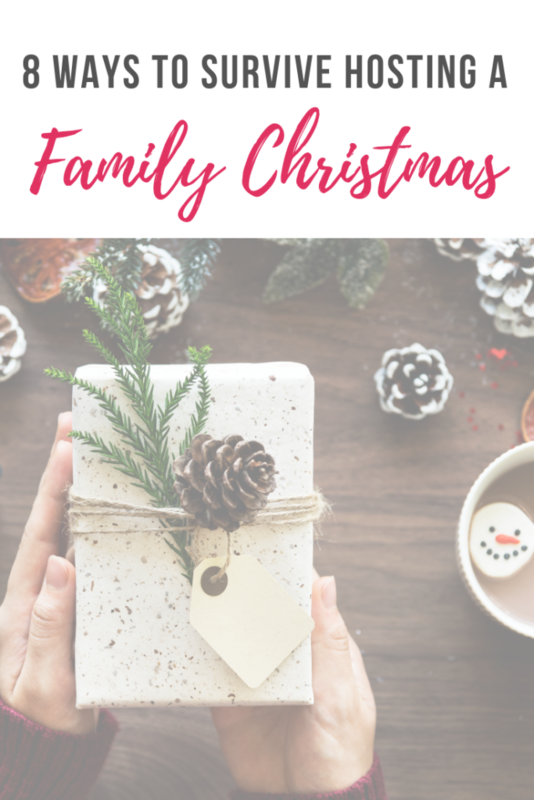 For more tips on getting ready for the Holidays, check out my handy How To Articles: How To Get Prepared For The Holidays and Minimalist Christmas.